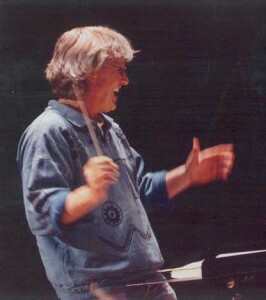 Ray Vincent Adams (1952-2013), born in Brooklyn, New York, was raised in Pearl River, New York, and began his conducting studies at S.U.N.Y. Fredonia under Harry John Brown. Upon graduation he received his certification as a Registered Music Therapist and lived in Texas and New Mexico. In 1976 he moved to Carbondale, Colorado, near Aspen and began his studies as a Conducting Fellow with the Aspen Music Festival under Murry Sidlin. Mr. Adams participated in Master Classes with Jorge Mester, Leonard Slatkin, and Sergiu Commissiona. One year after his arrival in Aspen, he began conducting choral concerts as well as his annual Messiah concerts which after 35 years have become the oldest running holiday tradition in the Roaring Fork Valley. Under his direction, the Aspen Choral Society incorporated in 1995 and began to focus on choral masterworks. Adams conducted the Aspen Choral Society the Mozart Requiem, the Mozart Great Mass in C Minor, the Brahms German Requiem, Haydn’s Lord Nelson Mass, and Bach’s Cantata #80, Ein feste Burg ist unser Gott, which were all performed at Harris Concert Hall, on the Aspen Music Festival grounds. Mr. Adams and the Choral Society also featured members of the orchestra in performances of Mozart’s Violin Concertos #3 and #5, the Strauss Horn Concerto #1, Beethoven’s Violin Concerto in D, Mozart’s Sinfonia Concertante, and Bach’s Concerto for Two Violins in D Minor, the Third Brandenburg Concerto and the Third Orchestral Suite. As the Composer-in-Residence for the Aspen Choral Society and for a time the Aspen Community Church, Mr. Adams continued to compose until his untimely death in March, 2013. He completed a suite of five sacred pieces for chorus and orchestra, all of which were premiered with the Aspen Community Chorus, the Aspen Women’s Chorus, the Glenwood Springs Community Chorus, and the Glenwood Springs Women’s Chorus between 2000 and 2006. This sacred suite includes Angels, Revelation, Requiem, Passion, and Creation. Additionally he wrote Rumi, Songs of Love, a song cycle based on the poems of the Sufi mystic, Jelaluddin Rumi, premiered on Valentine’s Day of 2002. He also premiered Aspen Songs, a cycle of six songs for soprano, violin, cello and piano in the spring of 2008. In the late 2000s, Mr. Adams did a two-month residency at Dorland Mountain Arts Colony in Southern California, where he was very prolific. Over the years, Mr. Adams and the Aspen Choral Society collaborated with the Aspen Chapel Choir, the Snowmass Chapel Choir, and the Symphony in the Valley. He also taught a classes in music theory and appreciation for both Colorado Mountain College and the Carbondale Council on the Arts. Mr. Adams was a Corporate Member of the Aspen Music Festival and School. Hi! I went to Aspen few yrs ago and I became friend with Ray! I was listening music in “Pandora” and while listening to this particular play I instantly remember him! I look out in the internet under his name since I lost contact with him to see info on his play for this Christmas. To my surprise I saw the news about his death!!! I was complete shock!!! I just want to express my deepest condolence to his friends an his “second family” at the Aspen Society for your lost! to his family, friends, the people of Aspen and his son …he was a great man! with a beautiful talent! I am so sorry and sad! RIP dear Ray! I will always remember you! I know you are in heavens conducting the Angels chorus now! Thank you for this beautiful memorial montage!